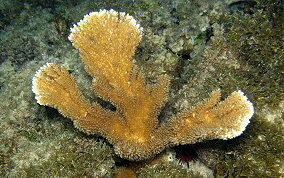 Elkhorn Coral is found in shallow water or atop rocks along a rocky shore line. Often growing up to the surface of the water. These is some controversy as to whether Elkhorn Coral is a mature/ancient life stage of the Fused Staghorn Coral. My personal belief is that it is. 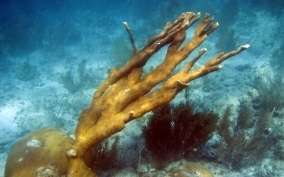 It is thought that Elkhorn coral grows in relation to the direction of surge. I believe that the Elkhorn Coral looks as if that's true because any new branches that would grow against the surge would eventually be broken off. All that would remain are those branches that give no resistance to the waves. Colonies are cinnamon colored.